If you can't figure out which of our high-quality options is right for you, please call our customer service team for guidance! We strongly recommend adding a protective case to all foam toppers. Latex toppers have small crumbs that fall off and memory foam pads can rip or tear and both gather dirt, hairs, and lint easily without a case. Cases come with a zipper on 3 sides for easy removal. However, we recommend you try to avoid removing the case. If you do remove the case, all memory foam toppers must be kept flat at all times. 100% cotton cases may shrink if washed, we recommend dry cleaning. Most people choose either our soft or medium feeling latex mattress topper. The soft foam mattress topper feels nice, cushy, and soft while the medium density is reported by many customers to offer the perfect balance of comfort and support. 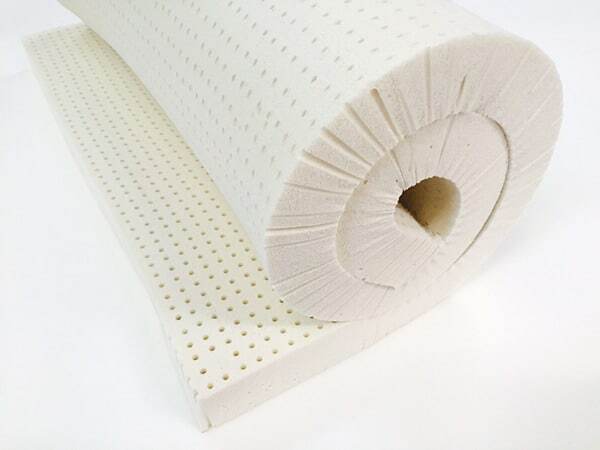 This foam mattress topper is a natural product and needs a fabric case to reduce air flow and slow the natural biodegradation caused by it drying out. Without it, biodegradation is accelerated. 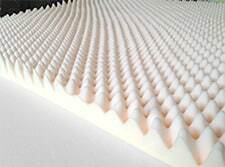 Latex mattress topper foam has naturally occurring flaws that include discoloration, small tears, small air pockets, and the visible holes do not always go all the way through. Small crumbs shed off the material. Natural biodegrading of a latex mattress topper is slowed with a cotton cover. Only the California King size foam mattress topper is made with a glue seam. "ILD" is the hardness numbering system for rating the firmness of foam. ILD is the number of pounds it takes to compress a sample of latex one inch. We carry 5 different firmnesses: Soft N25 (11-18 ILD), Medium N28 (24-28 ILD), Firm N31 (30-35 ILD), Extra Firm N36 (39-44 ILD), and Hard N45 (58-64 ILD). Memory foam mattress topper material is made without any flame retardants. It is renowned for comfort and can eliminate tossing and turning. Motion will not transfer through our memory foam mattress topper (when uncovered). We offer every size foam mattress topper including Twin XL (extra long), which measures 38×80. Memory foam mattress toppers will either come out to the edge of your mattress, or in some cases be 1/2-inch shorter. The lower density memory foam mattress topper allows you to sink through, while the higher density ones provide more resistance with better performance over their life. Our most popular and most demanded deluxe memory foam mattresses use 4" of our 4.5-lb density memory foam. 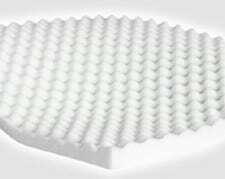 If your mattress is already dipping you cannot solve this problem with any foam mattress topper. You need a new mattress. Conversely, if your mattress is too firm, it can be made very comfortable with our memory foam mattress topper. We've been selling our memory foam mattress topper line since 1997, long before they became popular. Our experience has shown us that any memory foam mattress topper with less than a 4.5-lb/ft3 density tends to break down and soften over time. You may pay a little more for our memory foam toppers, but you really do get what you pay for. Find a discounted latex mattress topper or memory foam mattress topper in clearance. Egg crates have long been a popular solution for softening a firm mattress. These egg crate foam toppers are approximately 2 inches (5 cm) thick and made from our good quality C30 foam. Many people use egg crates with the bumps facing up or down. This foam has a 1.8-lb/ft3 density that contrasts with toppers from major chains that have a density of about 0.8-lb/ft3, or less than half the quality. Our C30 egg crates are a good quality and will last much longer. Additionally, the foams used to produce these pads do not contain any toxic fire retardant chemicals. This approximately 3-inch, extra thick egg crate pad is made using our premium EverFlex™ foam. This higher quality foam will last even longer. These have a density of 2.5lb/ft3 and is the perfect foam topper for fans of great egg crate pads. It will not flatten out like those discount egg crates from chain stores. The long fingers will gently press all along your spine, stimulating your pressure points and relaxing your body ... for up to 15 years! We produce these approximately 2" egg crate pads using certified 100% natural rubber. You've never felt anything like this! It is very important to get the cotton case with these egg crate pads. 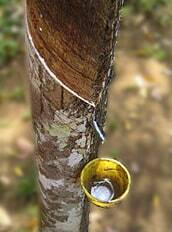 These all-natural rubber products need the protective layer. Without it, biodegradation is accelerated, and the product will slowly crystallize and dust off. California King size is seamed. Latex mattress topper foam (certified 100% natural foam made from sap of the rubber tree) and a memory foam mattress topper both offer superior contouring support and improved circulation when added to a firm mattress. This results in less tossing and turning and the best night's sleep. The main difference is that a memory foam mattress topper is quite still while the latex mattress topper is springy and lively feeling. Both toppers provide high-end luxury comfort and are resistant to dust mites. Our foam mattress toppers can also reduce or mute the effects of your partner's tossing and turning. We strongly recommend the latex mattress topper for its all-natural properties and benefits—it is certified natural tree sap. Memory foam mattress topper material, also known by the popular brand "T-Pedic," is a polyurethane foam, which is derived from petroleum. 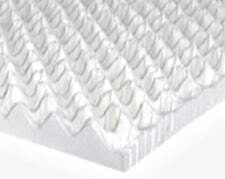 Our egg crate mattress toppers are also made from standard polyurethane foam. Our memory foam and C30 (five-year grade) egg crates are made without the use of any flame-retardants. Read about flame-retardants. Natural Latex is a certified 100% natural rubber foam—no chemicals. Many competitors simply state that their foam is natural or even 100% natural. To ensure these claims are accurate, demand that they supply you with a link to or copy of a certificate from an independent lab, similar to our certificate that shows the test results, not just a useless "certification". Any manufacturer wanting to compete in the 100% natural market has already got these certificates, but anyone else who says their products are natural are usually only about 80% natural and 20% petroleum. Don't be fooled! We hope you find this information particularly helpful in choosing the right mattress topper. If you have any questions or concerns please contact us. Latex is warranted for 15 years, and 4.5-lb memory foam is warranted for 10 years. Biodegradation is not warranted. Our memory foam mattress topper should be kept flat. They may form rips over time without one of our cases. Our 4.5-lb density will not soften or form any depression for 10 years. The 2.5-lb is not returnable. They are warranted for three years from forming permanent dents or body impressions. They will gradually soften over time. A foam mattress topper is used to soften and improve a hard or firm mattress. They do not improve a sagging mattress or one with body depressions, which mean you need to buy a new mattress. When selecting a foam mattress topper you should consider how much "cushioning" or "improvement" you want. Typically, most people prefer a 3" mattress topper as it produces the greatest increase in comfort for the price. People who select a 2" thick topper do it because they are on a budget or only desire a slight improvement in their comfort. Most stomach sleepers also prefer 2" toppers while side sleepers prefer 4" in thickness. If you are not completely satisfied, all 3" latex foam toppers and any thickness soft density latex or 4.5-lb memory foam toppers may be returned within 90 days—no restocking fee. How should I protect my foam mattress topper? Any foam mattress topper is a magnet for dust and dirt, and will tear easily. 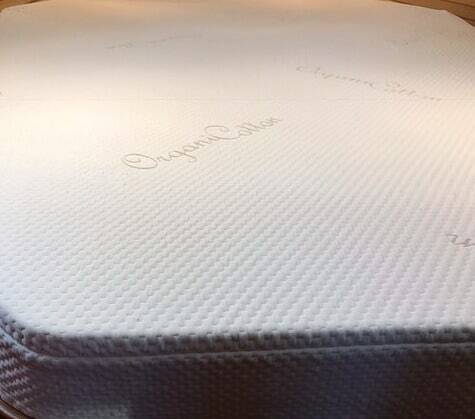 Our cotton covers are custom sewn to completely encase your foam mattress topper. These are highly recommended to protect your foam from staining or tearing. The covers are made of soft 100% cotton, and have a deluxe satin finish. All covers have a zipper so that they can be easily removed and dry-cleaned. Please note that since our covers are 100% cotton they will shrink if washed. We cannot accept returns on shrunken covers. Choose from our regular cotton or certified organic cotton cover. Our soft organic cotton fabric is very nice and thick (300 grams). It is a woven style called a double knit, which is two layers of fabric cross-knitted together. This thicker fabric does a much better job of reducing airflow and slowing biodegradation than our simple single layer "cotton covers." If you are inclined to purchase this cover you might also be interested in our pre-wash/pre-shrink service. For $45 we will pre-wash/dry on hot the fabric before we sew it to your order size. This will prevent shrinkage later if you wash the cover. Simply add comments into the shopping cart if you are interested in this added service. Our basic "cotton covers" have the thickness of a bed sheet. This does a great job to protect your foam from gathering dirt or tearing. See our foam mattress topper clearance to find discounted stock. These discounted items are priced to move. The same warranty will apply unless noted otherwise.